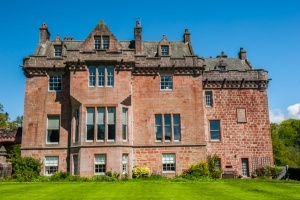 Sorn Castle is situated on a cliff above the River Ayr. 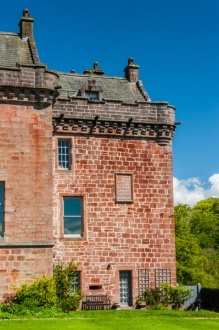 Built of pink sandstone, Sorn dates from at least the early 15th century, with 18th and 19th century additions. Old oak ceilings impart a sense of history to the interiors, which boast historic paintings and family heirlooms. 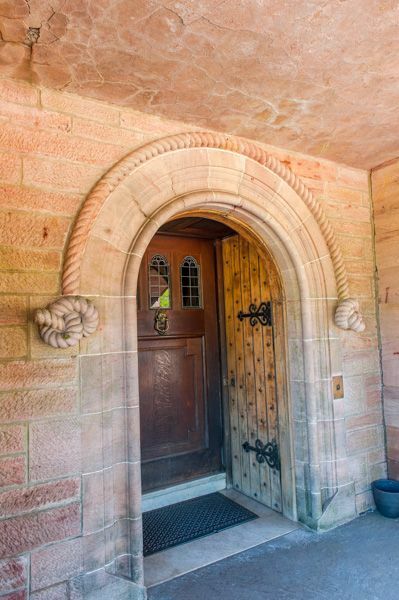 Sorn belonged to the Keith family of Galston in the late 14th century, and from them, it passed to the Hamiltons. 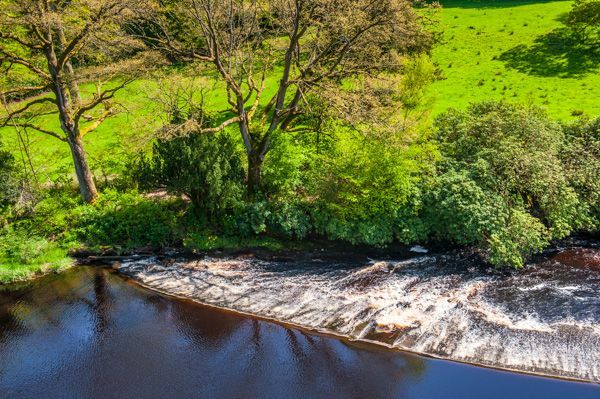 It was probably one of the Hamilton owners who built the earliest part of the castle we see today; an early 15th century fortified tower house that occupies the south-west corner of the castle, nearest the river. 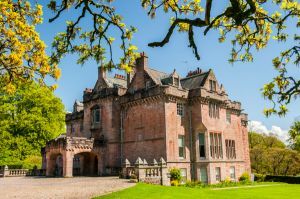 Tradition suggests that James V visited Sorn for the marriage of Isobel Hamilton to George, Lord Seton, though it may be that the king to visit Sorn was actually James VI, for the marriage of Isobel Seton to the 1st Earl of Perth in 1606. Apparently, the king was so worn out by the rough journey from Glasgow that he was heard to say that if he could play the Devil a trick he would send him from Glasgow to Sorn in the depths of winter. The prize possession of Sorn is a large flag of white silk that hangs in the entrance hall. This flag, now frayed and worn with age, was carried by the Covenanter army at Drumclog, and in a procession to celebrate the coronation of William III following the Glorious Revolution in 1685. The flag bears the words "For God and the Presbyterian Reformation, for crown and country", the initials W.R. (William, Rex), a royal crown, and the date 1689. Why is the Covenanter's Flag here at Sorn? For the answer, we must return to the religious turmoil of the late 17th century. In 1665 Charles II seized Sorn and garrisoned it with royal troops as part of his efforts to impose control over unruly Presbyterians in the area. His dragoons terrorised the local inhabitants and killed at least 2 local residents. If the local area was not already firmly in the Covenanter camp, they became so after the high-handed way the king's troops behaved. Much of the lovely gardens that surround the castle were laid out by the formidable Dowager Countess of Loudon, who came to Sorn in 1727. She laid out riverside walks and planted trees along the waterside and throughout the parkland. In 1837 workmen laying out a walk by the Cleugh uncovered a stash of some 500 copper and silver coins, some of them as old as the 14th century. Some of the silver pieces had been clipped. The presumption was that the coins had been hidden by Covenanters. The government seized the hoard, but some 50 coins were returned to the castle and are kept there still. 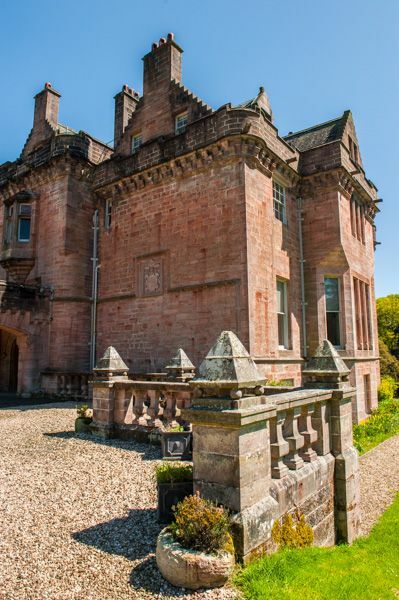 Starting around 1865 the castle was extended by the Somerville family, who employed architect David Bryce to transform the old structure into a Scottish Baronial style mansion, with fanciful turrets and conical towers. 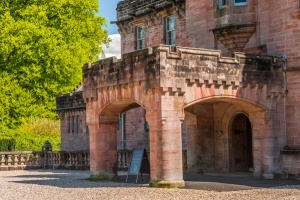 In 1903 the castle was purchased by Thomas McIntyre, who completely altered the exterior with the addition of a porte-cochere (a drive-through entrance porch). McIntyre also added a new wing centred around a beautifully panelled billiard room. 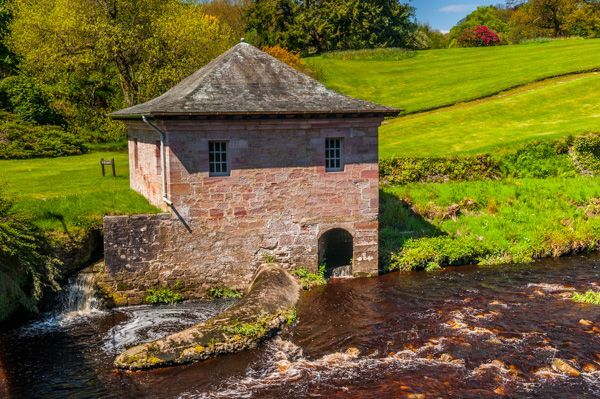 A short walk from the castle leads you to a turbine house on the river bank. 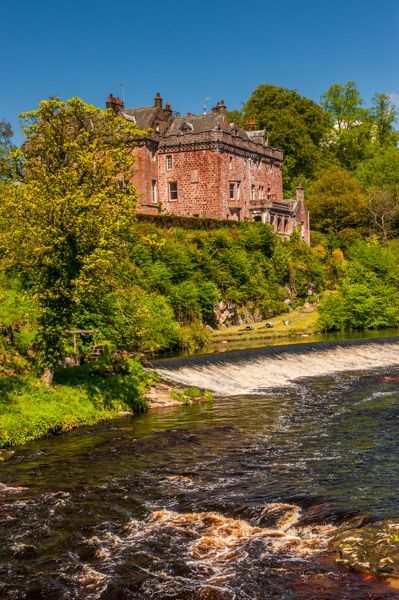 This was built as part of the Edwardian expansion of the castle and, combined with raising a dam to control the water flow, helped the castle supply its own electric power. By sheer chance, we met the owner at the front door of the house. He proved to be a very friendly fellow and asked where we were from while apologising that no one was waiting at the door to take us on a tour. He found his housekeeper, a lovely and very friendly woman, who guided us around the house like old family friends. 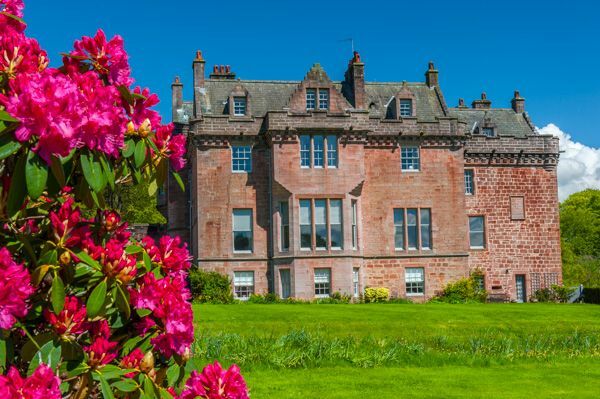 And that is what I remember most about Sorn Castle, apart from the wonderful setting above the wide River Ayr; it was very much a lived-in, and obviously much-loved family home. The sense of continuity down the generations of owners was almost palpable. Our guide took us out onto the balcony overlooking the weir, and the views down the river were simply stunning; I felt ready to move in! The interiors were full of fascinating little touches, several that stick in my mind were a small alcove where a friendly ghost is said to sit and watch by the window, and the secret doorways in the medieval tower. Our guide challenged us to find the doorway to a corner stair, but try as we might, we couldn't spot it, until she put us out of our torment and showed us the door handle, there in plain sight! The interiors are a wonderful mix of time periods, from the 15th-century tower to a lovely Georgian dining room, to the Edwardian billiards wing. The walls are hung with family portraits, but this is not a museum=piece, like too many stately homes, it is a family home, and as we moved from room to room you could follow the timeline of history, and listen to the guide tell us the fascinating stories of people who lived at Sorn for over 600 years. I highly recommend Sorn Castle; in fact, I wish they had more open days so more people could get a chance to visit. At present the castle is only open to visitors for about 6 weeks in early summer, so please check the official website before making travel plans. 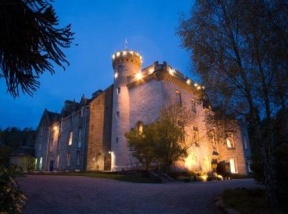 Nearby accommodation is calculated 'as the crow flies' from Sorn Castle. 'Nearest' may involve a long drive up and down glens or, if you are near the coast, may include a ferry ride! Please check the property map to make sure the location is right for you.